The current year is quickly coming to a close, and Chain Store Guide has assembled the Casual Dining Dashboard for the third quarter. 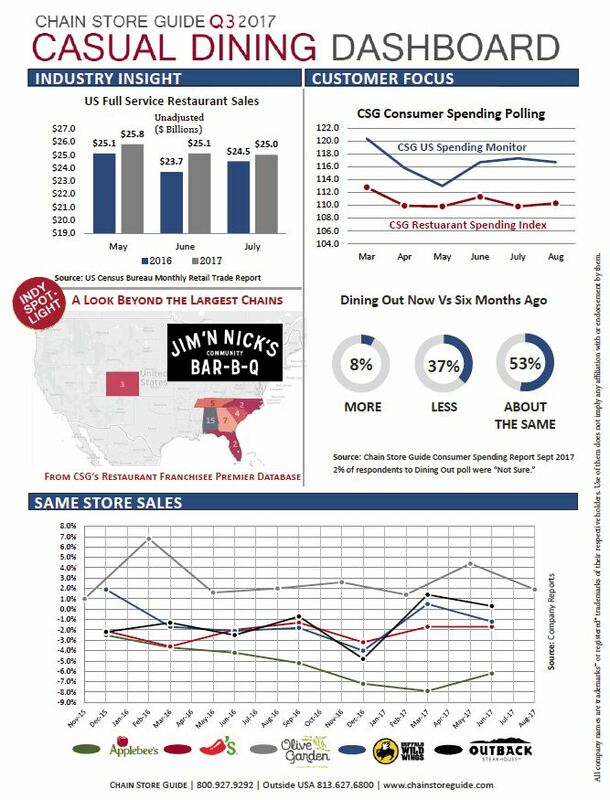 On the board, CSG polling data shows that consumer spending sentiment has remained on a relatively even keel over the preceding three months, while Census Bureau figures show that overall sales at US full-service restaurants were up for the first part of summer 2017. Looking at same store sales data at five of the largest casual chains, only Olive Garden and Outback (barely) saw positive results during their most recently reported quarter. Applebee’s continues to struggle as Q2 same store sales fell 7% against a year-ago quarter that itself saw same store sales down 4%. This month, we’ve extended the comp sales chart back in time by a couple of additional quarters to provide some greater perspective on where the casual segment has been and where it’s heading as we close out 2017. Next month, we’ll chart the current state of affairs in the QSR & Fast Casual segments.